Poznámka: Není-li váš operační systém nebo jazyk uveden v seznamu, nemáme informace týkající se dostupnosti ovladače. WIA Scan Driver for the WorkCentre 6015B (3-in-1 model without fax). This driver must be installed with the Add Scanner Wizard and is used with a USB connection. WIA Scan driver for the WorkCentre 6015N-NI (4-in-1 model with fax). This driver must be installed with the Add Scanner Wizard and is used with a USB connection. Contains the entire CD image for the WorkCentre 6015B (3-in-1 model without fax) and launches the Easy Setup Navigator which can be used to install the print and scan driver software. 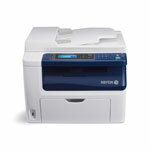 Contains the entire CD image for the WorkCentre 6015N (4-in-1 model with fax) and launches the Easy Setup Navigator which can be used to install the print and scan driver software. Contains the entire CD image for the WorkCentre 6015NI (4-in-1 model with fax and wireless) and launches the Easy Setup Navigator which can be used to install the print and scan driver software.